Have you ever gone to visit a friend you haven’t seen for a long time, and found that your excitement began to get tinged with a little nervousness? I felt did actually feel a little nervous approaching my tree after a 5 month hiatus. I had no idea what to expect. I don’t know what my tree got up to during the summer months. I’ve done loads of walking this year, but it was all along the cliffs, somehow I never got round to adding on the short walk up the river valley as well. The last time I saw my tree, back in May, it still didn’t have any leaves, and I was still calling it an alder based on the buds. Except that then Laura suggested that it might be an ash instead. Its tricky taking photographs in the valley at this time of year, when the light is soft, first thing in the morning and again in the evening, it doesn’t really reach the valley bottom. But if you visit during the middle few hours of the day, as I did, you get blinded by the sun on the one side of the river and the contrast levels are annoyingly high. Ho hum. Still, the human eye is able to cope with it all quite happily and I was soon enjoying the sight of my sentinel tree, with all its knobbly bark. 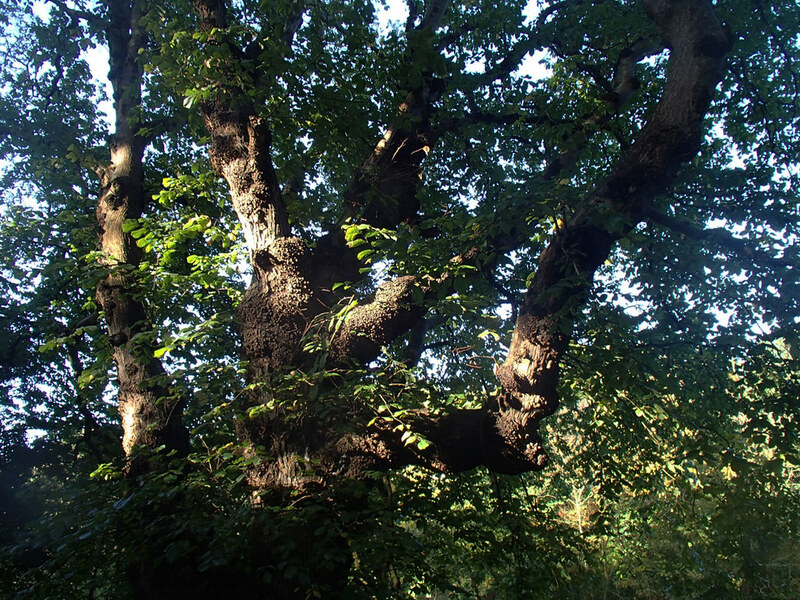 My sentinel is an alder. At least, I think it is, judging by the leaves, I’m not very good at this tree identification thing. Part of the reason I thought my tree was an alder too was because they both have the strange growths on the bark. 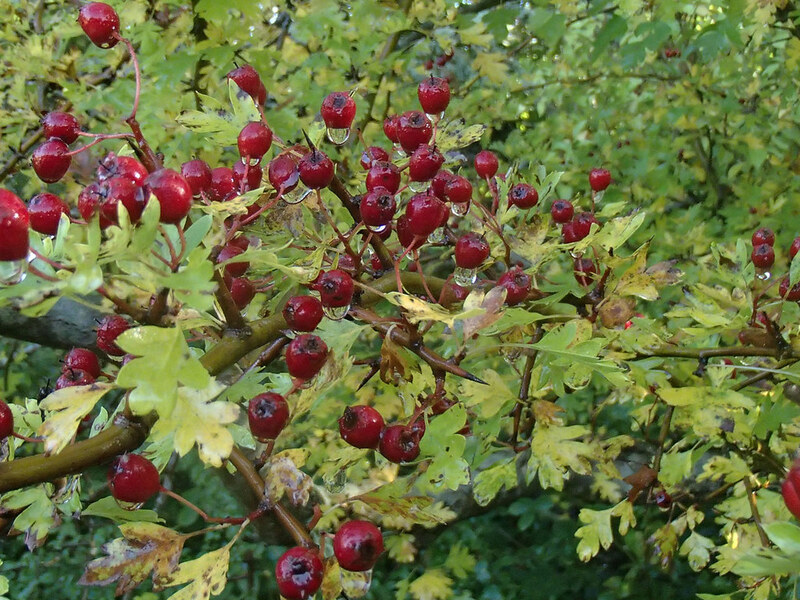 As I neared my tree I began to spot a little bit of autumn colour. Nothing dramatic, but there again this side of the river always feels a little more understated, wilder, than the other. And suddenly, there it was. Or they were, since my tree has two trunks, and grows very close to a third. I nearly picked the third, because it had a nestbox on it (which you can just see in the photo below, peaking out behind the leaves). I’m glad I didn’t though. I already knew it wasn’t the same kind of tree as mine, the barks were so different. What I hadn’t realised was that it is a sycamore. I don’t like sycamores. I spend hours weeding out their seedlings. There are loads in the village, probably because they cope with salt-laden winds well, but they produce so many seeds! And the tree sap does horrid things to our car, parked underneath. But I digress. This was my first glimpse of my tree for five months, and it was immediately obvious that Laura was right. 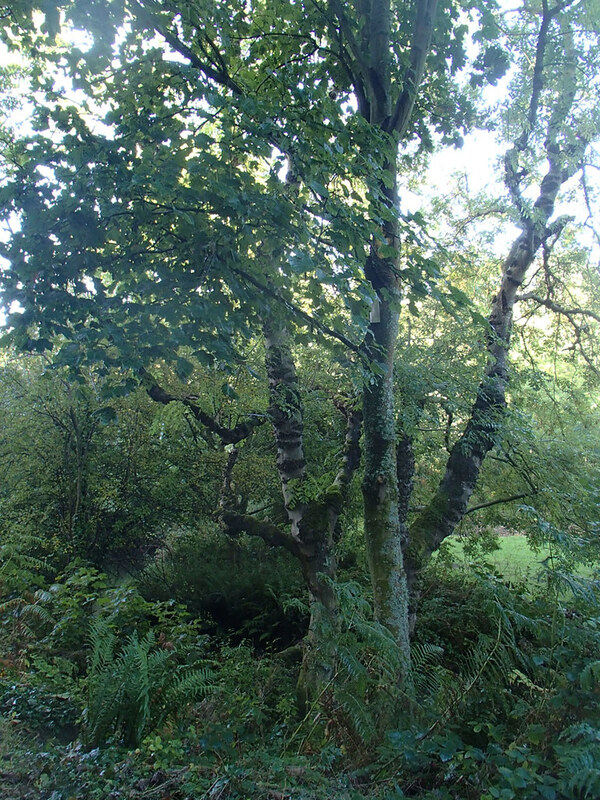 An ash, not an alder. But you will have to wait for the proof, because the photos I took of the leaves from this side of the river were rubbish. 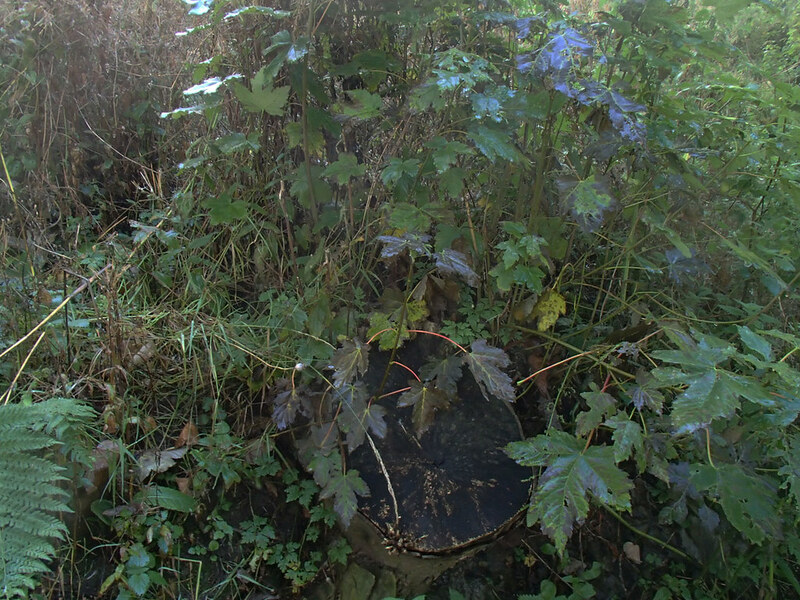 I didn’t venture down to the trunks this time, the ground was really slippery, but I was perversely pleased to see that one of the trunks has some ivy growing up it. I say “perversely” because I know a lot of people believe that ivy damages trees. The RHS are pretty clear that this is not the case, ivy won’t damage a healthy tree, though it may become a problem on old or damaged trees, concealing signs of disease and perhaps helping topple it because of the extra weight. Mind you, the RHS also says that on trees with a sparse canopy, such as ash, the ivy can get enough light to develop into its arboreal form. I wonder if that will happen here. Looking back the other way, you can see the strange scars on the trunk really clearly. 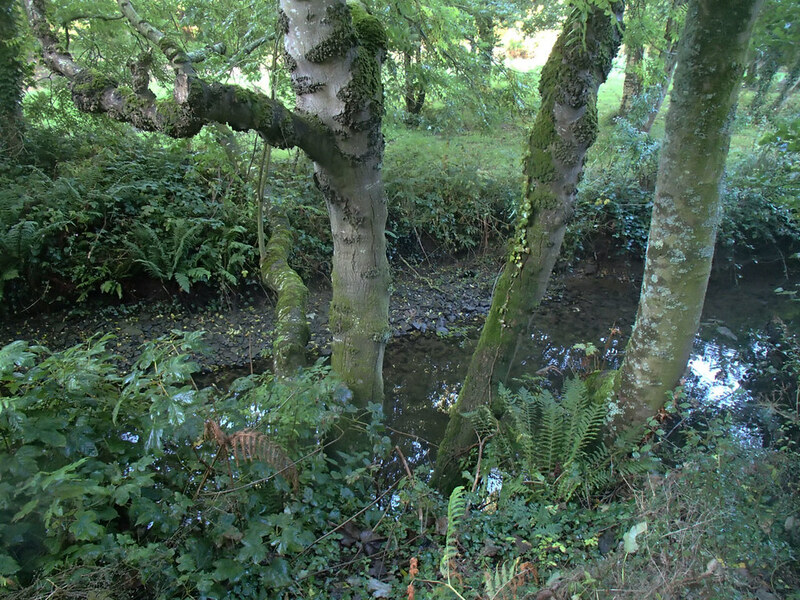 You can also see how the tree stretches out across the river, which was on of the things that attracted me to it in the first place. 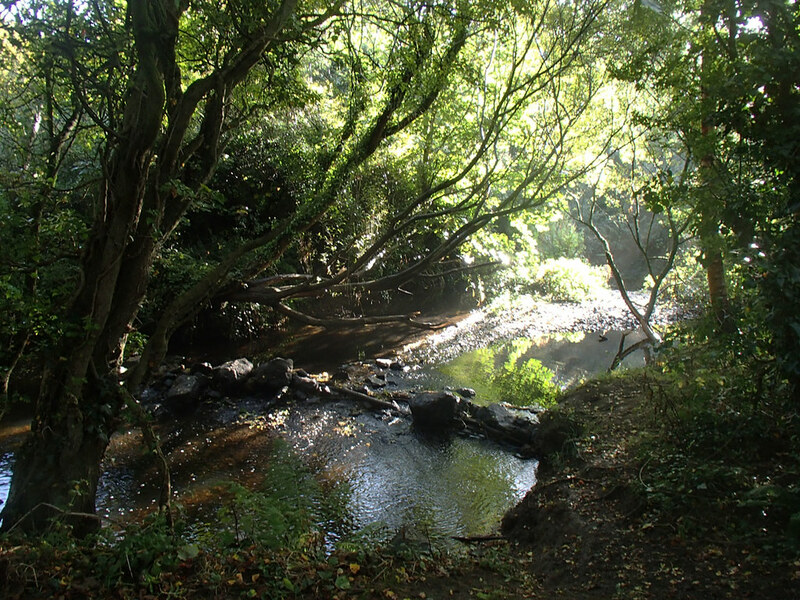 I carried on up the river to the bridge, enjoying the lichen and berries, and wondering what my tree would look like from the other side. There was a bit more autumn colour on the other side of the river, though the little grove of trees planted to make a real show at this time of year were still all green. 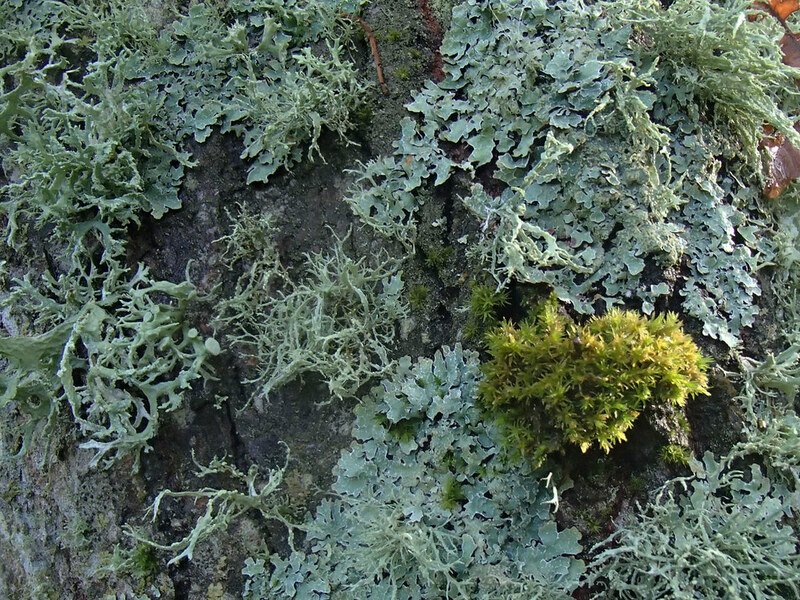 I passed one tree with an amazing collection of lichens and mosses on its trunk. The river level was really low, we’ve not had much rain for a long time now. When I finally got to my tree, I was genuinely astounded. The branches that reach over the river were so densely covered in leaves that I couldn’t see the water! The intriguing thing was that, once I pushed through the damp branches, I could see that the leaves only really adorned the ends of them, the sections that cross the river are remarkably free of leaves, but sport some rather nice lichens. 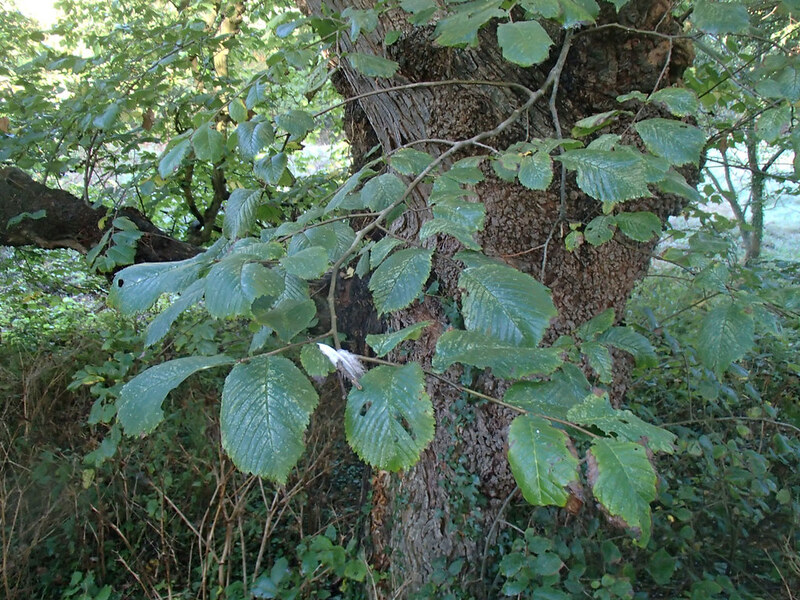 And the leaves are definitely not alder – very definitely ash! 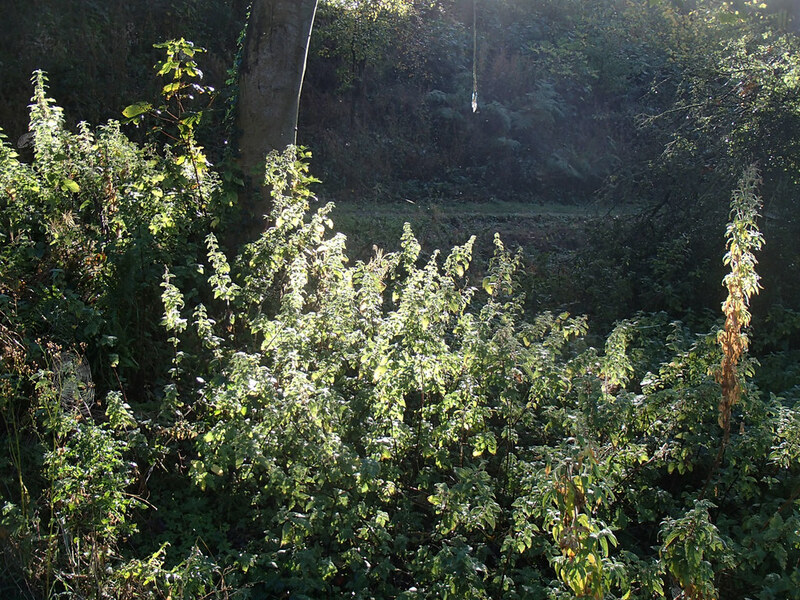 I was very restrained, and didn’t take myself off to the Heritage Centre for coffee and cake, but headed back to get on with some work, admiring the backlit nettles on my way. 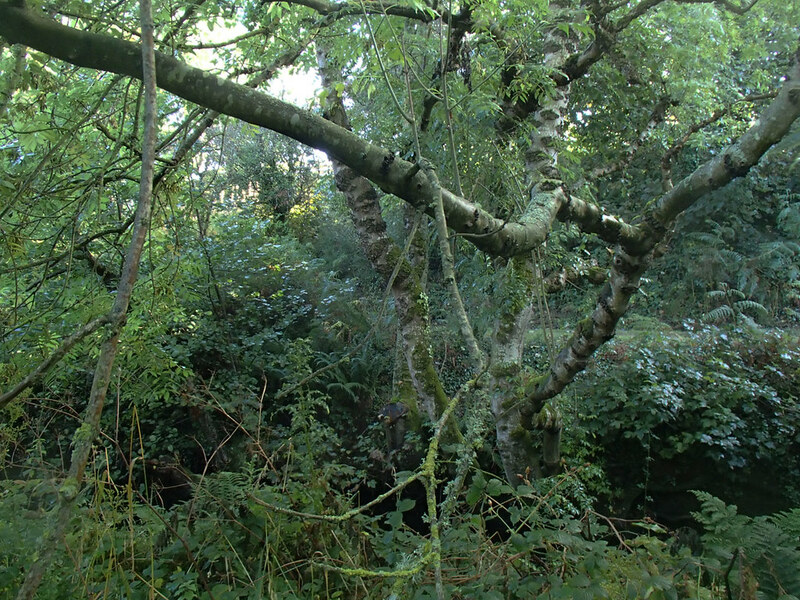 Our pair of ash trees in Porterville used to be decorated with a variety of lichens. Maybe Diana, I wonder if they “prefer” a certain type of bark? In the valley, it is usually the hawthorn and blackthorn that are festooned. What a surprise – but surely a pleasant one! I love ash trees :) It’s great you got to check it before the leaves dropped; our ash tree always did seem the first to lose its leaves, well before oaks or maples! Hi Any, yes, a little, although I was already pretty much convinced it was an ash after all because of Laura’s comment, she knows her trees! Unlike me… I’ll be interested to see how quickly it loses its leaves, autumn seems to be late to the valley this year, although my Rowan is already bare. 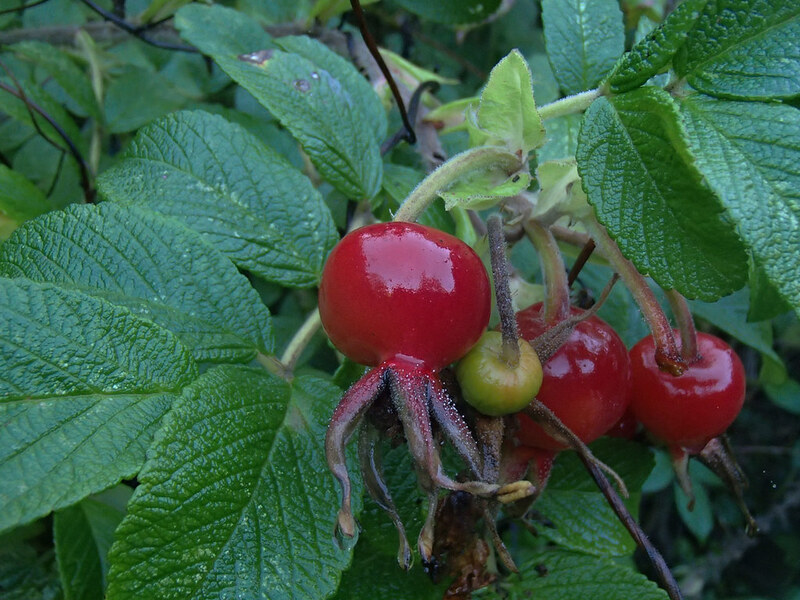 Wow, look at those Rose hips! They’re stunningly beautiful! I’d say you’ve done amazing things with a challenging light situation. 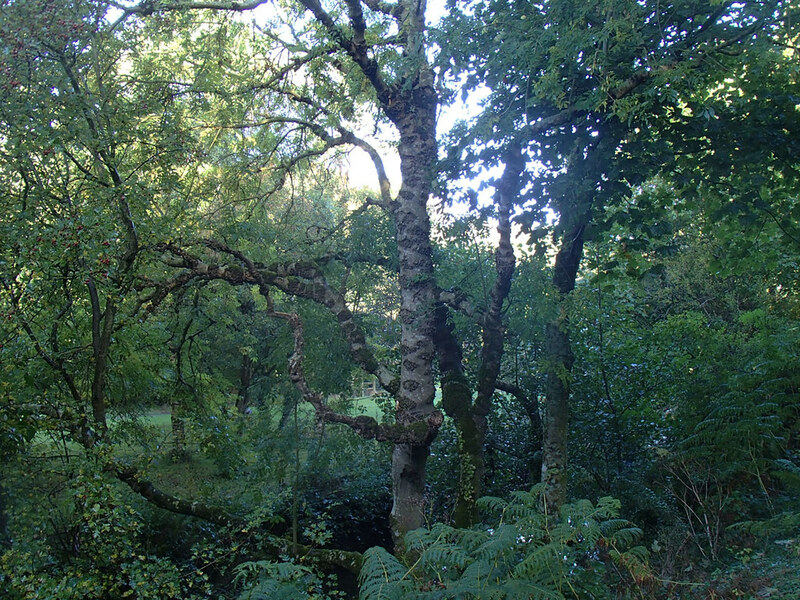 An Alder tree. This will be fun to follow your tree in the months ahead. I think I have picked out a tree, so now I need to get out there and photograph it. 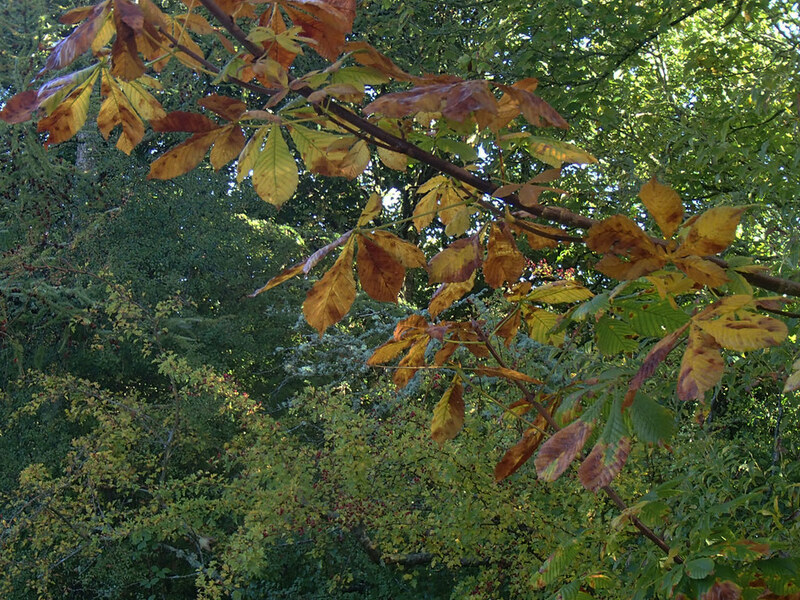 By the way, we have Horse Chestnut (Aesculus hippocastanum) trees here, too. 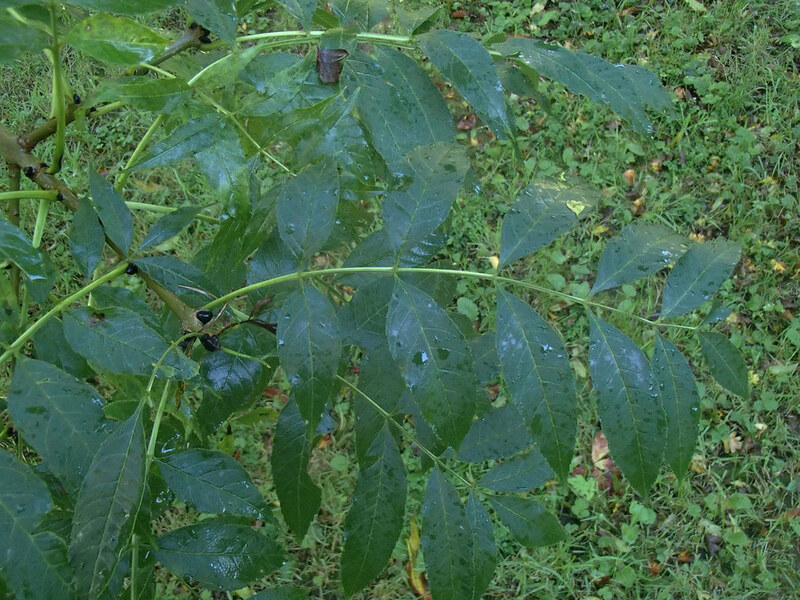 And apparently a hybrid of that tree and Red Buckeye (A. pavia) is common in my part of the country. I found an Aesculus volunteer seedling in my garden that I’ve potted and am looking forward to seeing what species it is when it gets bigger and flowers. Come to think of it, maybe that will be my tree! Thanks for this glimpse of all the beautiful trees in your area! Hi Beth, the rosehips were remarkably shiny weren’t they! I think I may pick a tree a little closer to home for next year, in the hope that it will mean I post more regularly about it. Fancy missing a whole season of my tree!! Following your volunteer sounds like a good plan. You had a lovely walk to get to your tree, we have 6 Ash in the garden here and they seed about just like sycamores, I’m always pulling them out. I love the way yours is gracefully dipping over the stream, mine are all so tall, they just grow straight up! It is a lovely walk Pauline, my problem is that there are so many lovely walks round here, and the valley is the more peaceful, for some reason I tend to be drawn to the drama of the cliffs and sea! As for ash trees self seeding, I think that is something to be grateful for then, the lack of ash trees in my immediate vicinity. Plus our neighbour has instructed a tree surgeon to further diminish the sycamores on the border of our two gardens, which should mean more light and fewer seedlings. Woo hoo!! I’m not good at identifying trees either so well done that you’re sure now. Your images are very good considering the difficult conditions. Thank you Christina, I took extra photos in the hope that some of them would be OK. It was good to finally confirm what the tree is, I do find it confusing, though at least there is loads of information on the web which really helps. you certainly held my attention throughout the walk until the denouement Janet – had to make myself stop and appreciate all the fruits and lifeforms that were spotted along the way (including tar spot fungus which I’d never put a name to though quite often observed) Your ash is already showing its tell-tale black, ashen buds – hence my original guess I guess! That tar spot fungus is ugly, isn’t it! And excellent call on the tree ID, it was pretty much a given once you had pointed me at that link, but the leaves kind of give it away ;-) The black buds are almost spooky when they are side-by-side with still-green leaves. I do enjoy sitting down and going for a virtual walk where everything I might wish to see is shown to me. You covered some ground between hips, berries, tar spot and lichen. No signs of ash dieback on your tree – at least it looks OK from your photos. 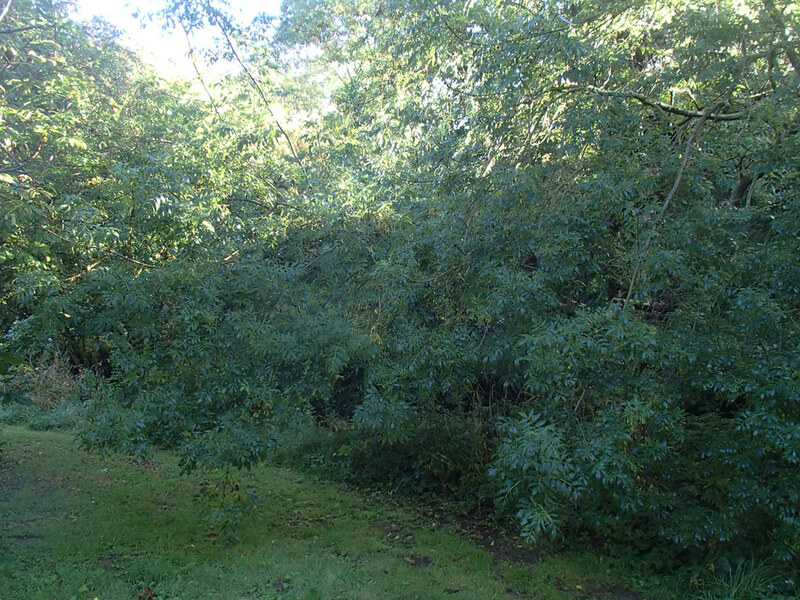 There are a few ash trees on our farm – the leaves are just starting to turn very autumnal. Congratulations on avoiding the cake! Yes an ash much like many of my trees, but yours has such character on the bark with lichen and moss and wow those branches are huge with so many leaves…quite a lot of character in that tree and in such a fabulous spot. Hi Donna, it does have bags of character doesn’t it,I loved finding the lichen. The lichens are amazing Cathy, I’d have shared more but the photos were really pants thanks to the glare of the sun. I am glad you now have clarity Janet! I like the way your tree bends and hovers just above the water. And lichen is definitely a sign of character! I hope you get a chance to visit it again this year. I have to admit to missing a few months of posting on my tree – and it’s in my garden too so no excuses really…. A wonderful wood with beautiful trees, especially your chosen tree. What a dramatic change since May. I know, almost unrecognisable as the same tree, I was particularly struck by how dense the leaves were on the “other” side of the river. I enjoyed your tree post Janet. 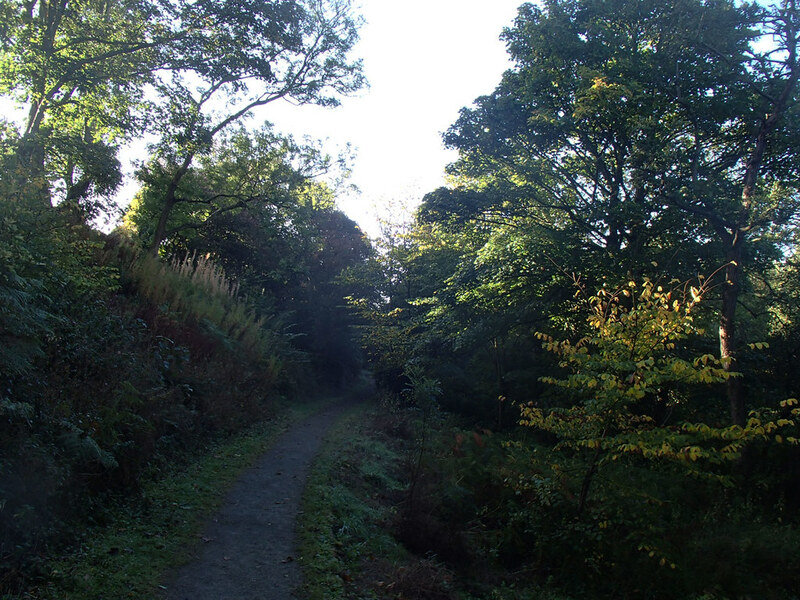 What a wonderful walk you took us on and such atmospheric photos. You rarely see such wonderful lichens here, they are so beautiful. I dislike sycamores too, they are the weeds of the forest. I get a lot of sycamore and ash seedlings in the garden and they are quite difficult to remove once they get to a certain height. Your tree looks beautiful reaching its arms out over the river. Janet, very satisfying to have identified your tree. 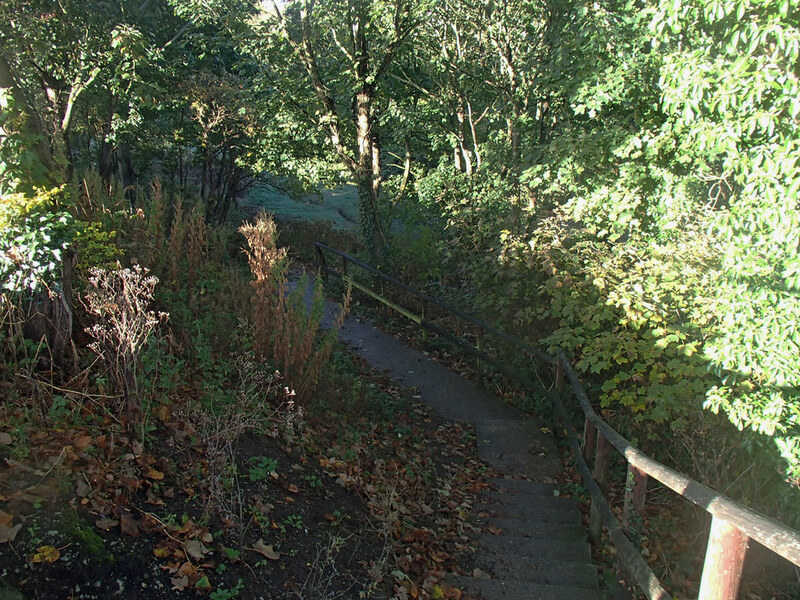 Your woodland is looking so good in early Autumn. Even the lichen looks interesting, clean air, not so much rain as usual, cant get better. Hello Alistair, it is good to have confirmed id, it had been bugging me. 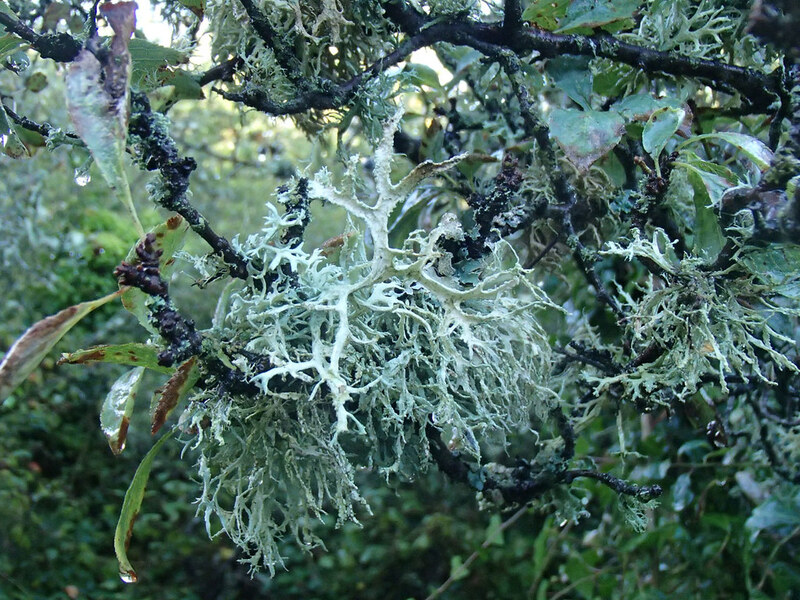 The lichens seem to be particularly good this year, I have no idea why, but I am certainly not complaining. Your photos are very atmospheric and foresty, I love them. The lichen is beautiful isn’t it? Thank you Sue, that’s a great compliment coming from you. The lichens are truly amazing this year, I love them. Loving the lichen! It makes for some beautiful photos! It also looks like a lovely walk, Janet. Glad you now know the true identity of your mystery tree ! I love the lichen too, I tried to get some photos of it all covered in frost the other year, but the valley was so sheltered I never saw any there. But if this winter is as harsh as forecast, maybe I’ll get lucky? Assuming lichen survives frost. And it is always good to solve a mystery. It’s actually a lovely tree, ash or alder or whatever – and I’m intrigued by the leaves at the ends of the branches thing. 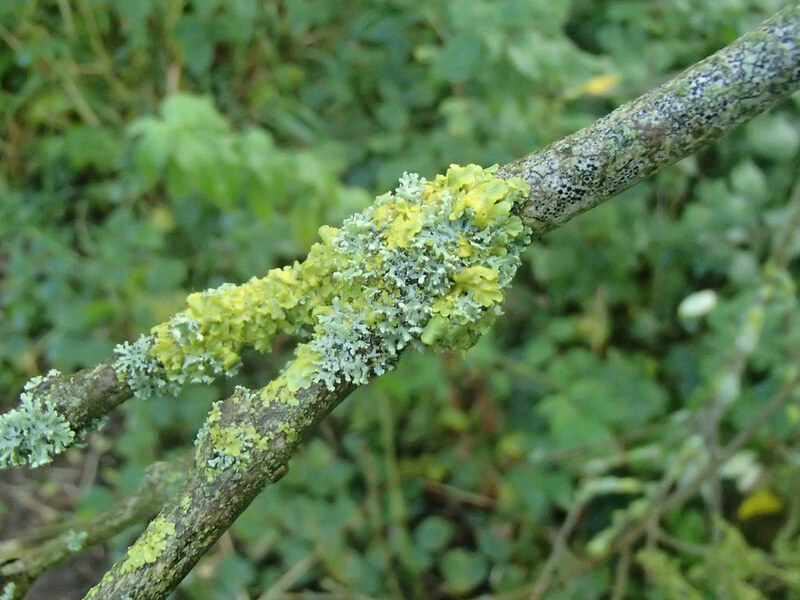 Lovely lichen, a bit different to that which grows on my hawthorn, and on other trees round me. Great shots! Thanks Kate, it is a little weird, isn’t it, the way the leaves don’t grow on the portion of tree that dangles out over the river. Thought you might like the lichen, it always astounds me how many differences you can spot when you start to look at them close up, though being an ignoramus I never know if it is different species of same species at different age or something. Any which way, very lovely, and am glad my tree has some of its own. Glad you have finally got in ID for your tree Janet. As has been said, the Lichen shots are great. You chose a beautiful day for your walk. Your images are wonderful. They captured the atmosphere perfectly. Thank you Angie, I was chuffed the lichen shots came out so well, I was holding the camera at weird angles for some of them! Gosh it’s all change here Janet since I last visited! Thanks for solving the black spot mystery. We inherited a couple of sycamores and I’ve been wondering what was causing these ugly markings. What a fabulous place to go tree visiting and moss stroking. It is a lovely place, we’re really lucky to have it, and so close the beach too. 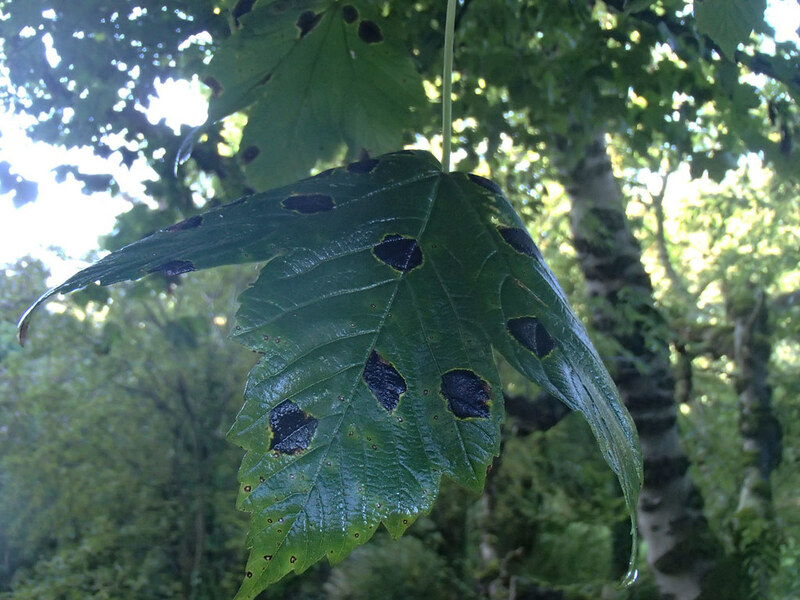 The black spot disease seems to be everywhere this year, perhaps because the trees were stressed by the long dry spell? It is very ugly. Sycamores around here also have disease issues with their foliage, especially in more-stressful-than-usual summers, though they don’t tend to be weedy. They earn their keep in winter when the bark shines out like bleached whale bones. “Bleached whale bones” sounds rather marvelous, wish ours did that!